Remember the childhood thrill of packing your brand new pencil case for the first day of term? The only thing that made returning to school after the summer holidays bearable for was the prospect of fresh new stationary. I might not be in education anymore, but I still have the urge to refresh my metaphorical 'uniform' when September comes around. A good place to start is with a brightly coloured satchel (no.4) to lift your everyday look in that 'fresh out of Harvard' fashion. Smart pens (no.1) will add style to your work desk and if you are a glasses wearer, a pair of new frames can completely change your day to day look. MyOptique recently sent me a pair of London Retro clear lensed frames to review (no.3) which have that stylish come geek-chic appeal. London Retro have just launched their autumn/winter 'Metropolitan' collection which takes inspiration from iconic London landmarks and tube stations - worth investigating if you are hunting for stylish and affordable frames. A new term look wouldn't be complete without brand new shoes - the Charlotte Olympia Kitty flats (no.2) are a playful classic that will see you through autumn/winter. 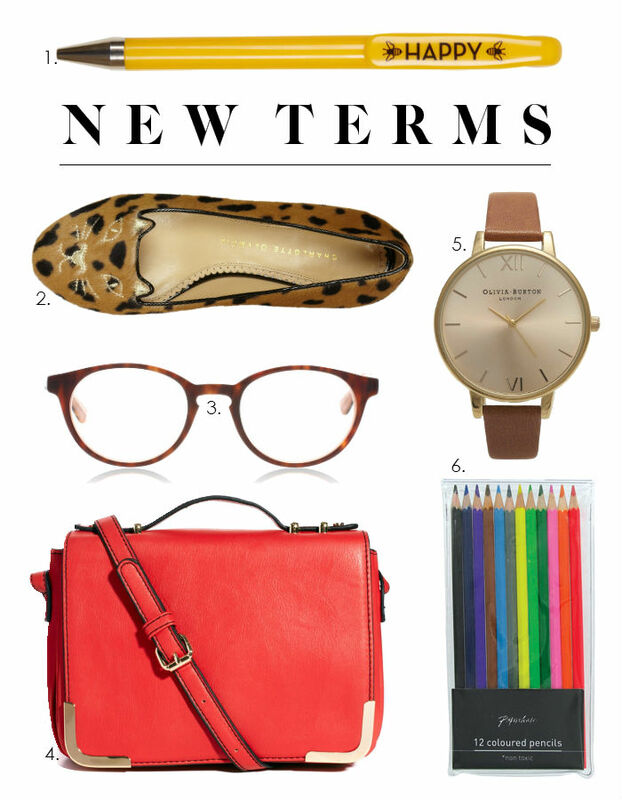 What are your new term essentials? 1. Yellow Happy seven year pen, Liberty, £6.95. 2. Charlotte Olympia Kitty slippers, Net-a-porter.com, £525. 3. London Retro Fitzrovia frames, MyOptique, £79. 4. Oasis cross-body bag, ASOS, £25. 5. Big Dial tan and gold watch, Olivia Burton, £68. 6. Colouring pencils, Paperchase, £2. For casual bank holiday attire, you can’t beat a sneaker/shirt combination. 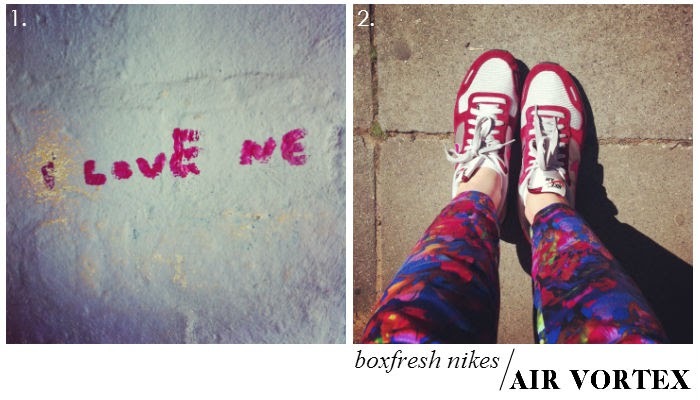 I am living in my Nike Air Vortex sneaks at the moment – they are the comfiest trainers I have found. You may have spotted my patchwork plaid Uniqlo shirt in the press recently- the fashion journos have gone gaga for it (gaga being the optimum word since Lady G’s former stylist Nicola Formichetti is Uniqlo’s new Creative Fashion Director) and coming in a range of colours at £19.90 a pop, expect to see it on every fashionable back come September. I can’t express how much I love Uniqlo at the moment- their designer collaborations offer great fashion for a budget price and their basics deliver on quality. 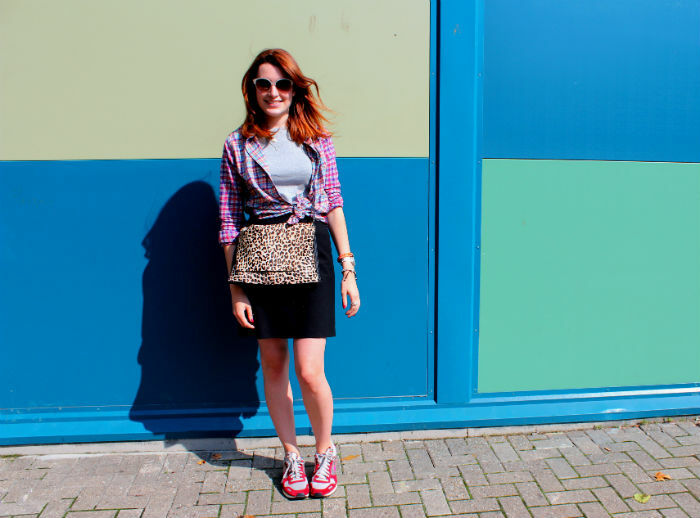 I wore my shirt with a simple black skirt, grey marl tee and my favourite Zara ponyskin bag for an easy Sunday look. 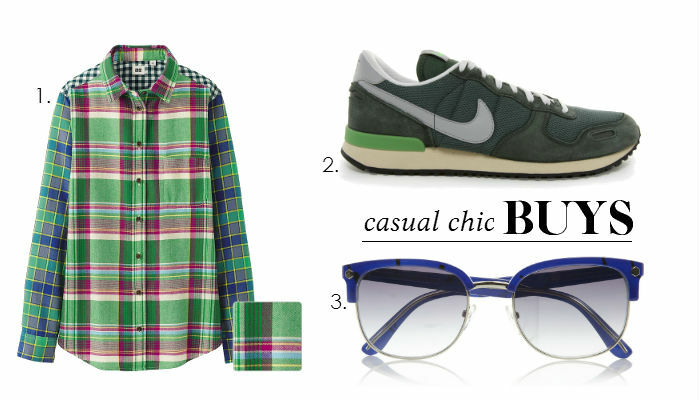 Will you be picking up some plaid for fall? Shirt - Uniqlo. T-shirt - Uniqlo. Skirt - charity shop. 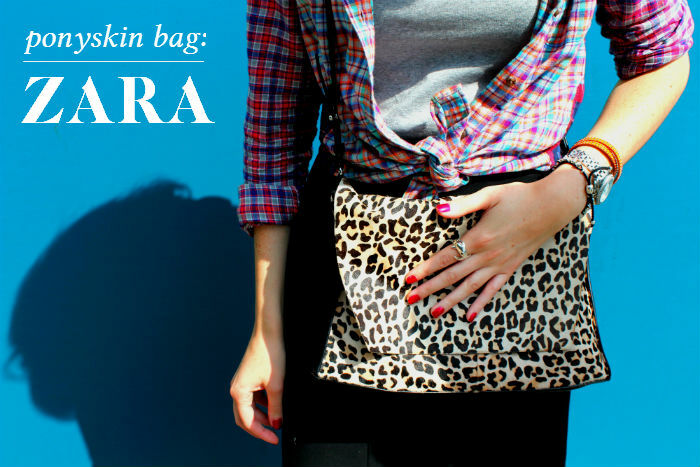 Bag - Zara [Similar]. Trainers - Nike. 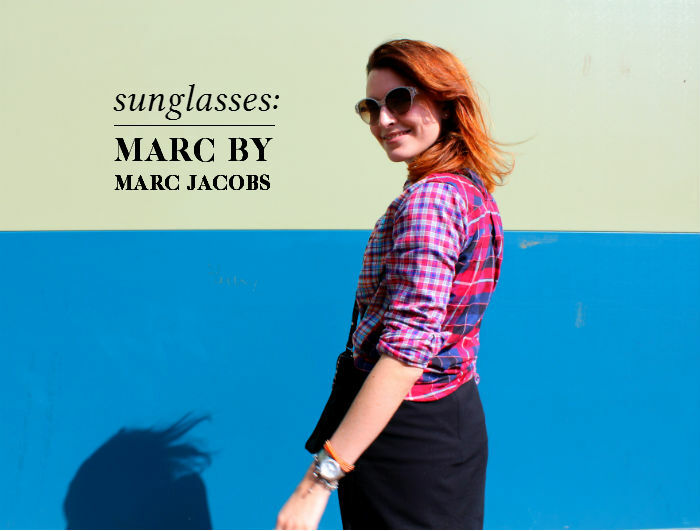 Sunglasses - Marc by Marc Jacobs [similar]. 1. 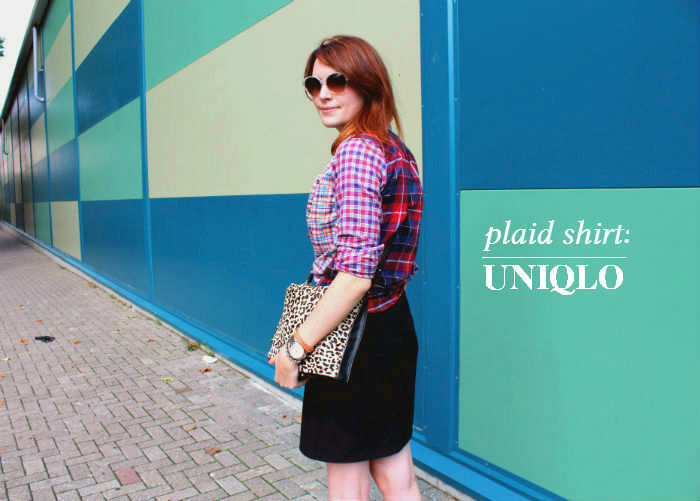 Plaid Shirt, Uniqlo, £19.90. 2. Green Nike Air Vortex sneakers, ASOS, £67. 3. Marc by Marc Jacobs shades, The Outnet, £57.74. 1. I spotted this written on the wall in my sister's apartment block and it reminded me of my favourite Oscar Wilde quote 'To love oneself is the beginning of a lifelong romance'. 2. 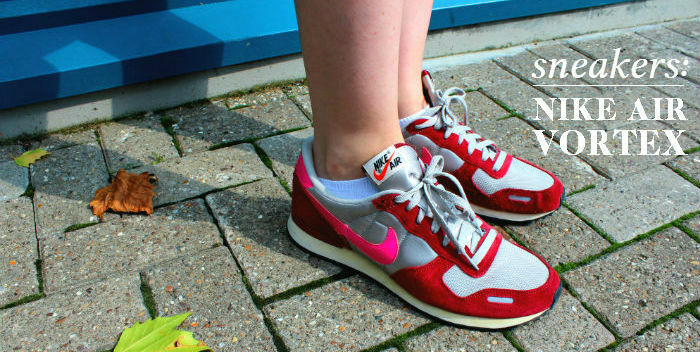 I invested in my first 'fashion trainers' - a pair of Nike Air Vortex. I bought a discontinued colourway off Ebay, you can shop the latest styles at ASOS. 3. To celebrate the new-wave of Italian culture, Peroni took up residency in Portland Place under the name of 'The House of Peroni'. I visited with Neena and enjoyed the fabulous Peroni-extract, peach and passionfruit cocktails (it may sound strange but it was the best cocktail I've supped this year) and modern art in an utterly refined setting. Peroni will be staging a similar pop-up later in the year, I'll notify you when it's back. 4. 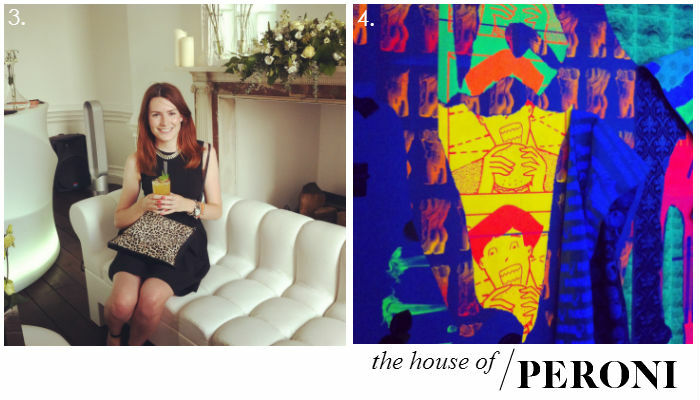 Neon art by Ludovica Giosca in The House of Peroni. 5 & 6. 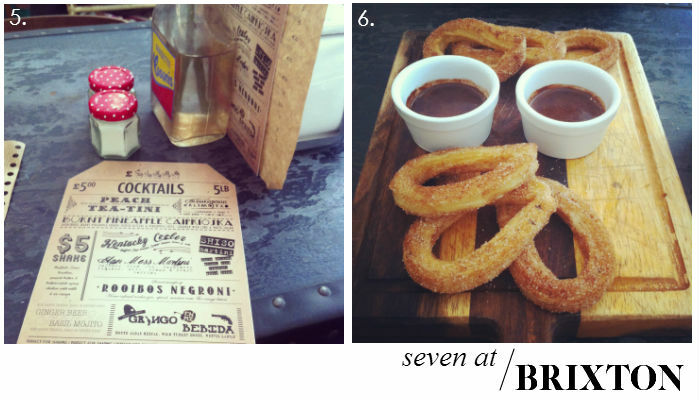 I visited my favourite eaterie of the moment, Seven at Brixton in Brixton Village. If you're London based and you haven't visited Brixton Village for dinner yet - you really must! Seven is a tapas come cocktail bar that serves incredible £5 cocktails (unheard of in London) and fantastic fresh churros with chocolate dipping sauce. 7. I heading to Kensington Palace for the Fashion Rules exhibition that features a curated collection of dresses worn by the royals. 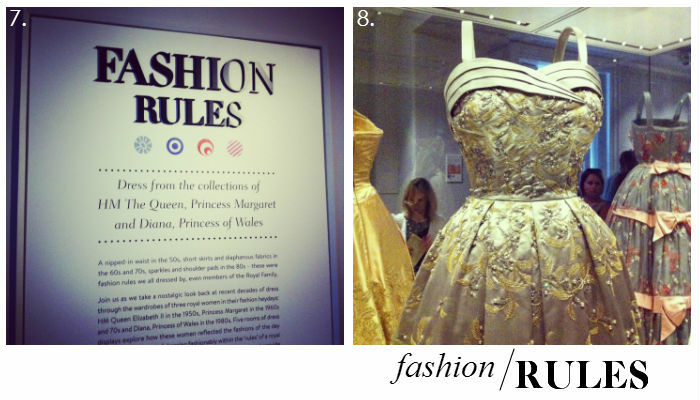 My favourite styles were the Hardy Amies and Norman Hartnell dresses worn by the queen (8.) that possessed a fairy tale like quality. Having grown up in rural Leicestershire, I will always be a country girl at heart. When I head home to visit my parents, I still pull on my farmer green wellys for a satisfyingly muddy walk across the fields. Joules recently kindly sent me their quilted 'Marcotte' jacket that I am excited to road test on my next trip home. I know there are plenty of quilted jackets out there on the high street, but the Marcotte jacket stands out because of Joules' attention to detail. I appreciate the addition of a hood that will be invaluable on a blustery autumnal day and the floral lining adds femininity to the countryside staple. One button bears a sweet fox motif too, it's the little touches that take this a classic coat to a special piece. 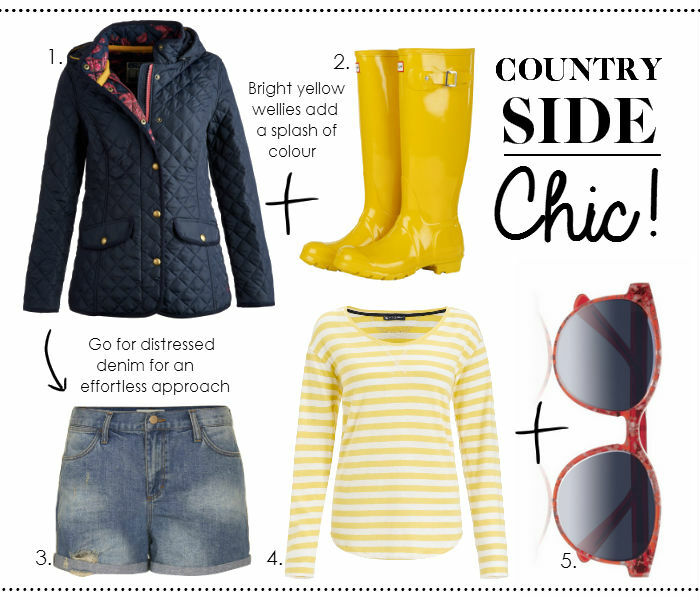 For some country chic inspiration I have styled the jacket in the sort of outfit I can be found in on a trip back home- a hint of breton stripe, some practical wellies and a dash distressed denim finish the look. Shop the Joules quilted jackets range. 1. Quilted Marcotte jacket, Joules, £99.95. 2. Yellow Hunter wellies, All Sole footwear, £59.99. 3. Moto vintage boyshort, Topshop, £32. 4. 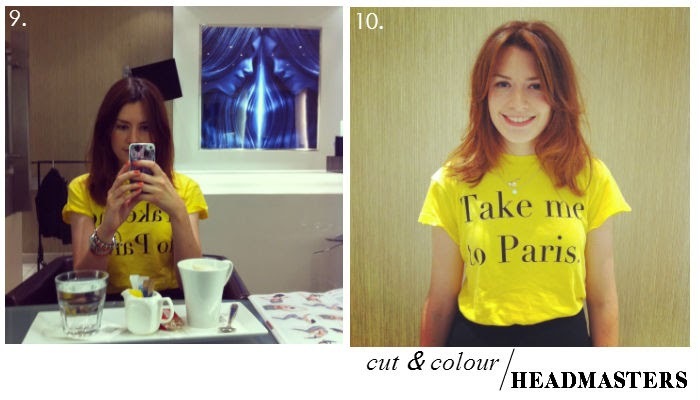 Petit Bateau yellow stripe hem t-shirt, Atterley Road, £25. 5. Thierry Lasry round-frame shades, The Outnet, £128.24. You can't beat the thrill of discovering a designer that hasn’t crossed ones radar previously and falling in love with their fashion. One such name new to LFF is Yigal Azrouël. New York based, Azrouël is of French-Morrocan descent and was born and raised in Israel. This rich cultural background is reflected in his designs, minimal sportwear inspired shapes exude New Yorker chic, whilst intricate prints (paisley features heavily in the collection) carry an ethic, exotic feel. 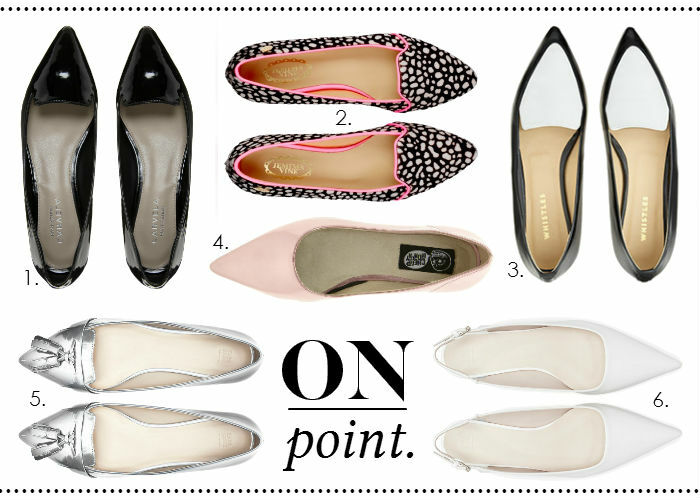 It’s this contrast between clean cuts and elaborate patterns that feels so ‘now’. Azrouël’s current offering also encompasses some show-stopping, dreamy evening gowns, but I am always drawn to the more wearable pieces in a collection. Take the mesh insert knitted sweater – directional in design this is still an easy style for day to day wear. What do think of the collection- have you discovered Yigal Azrouël before? 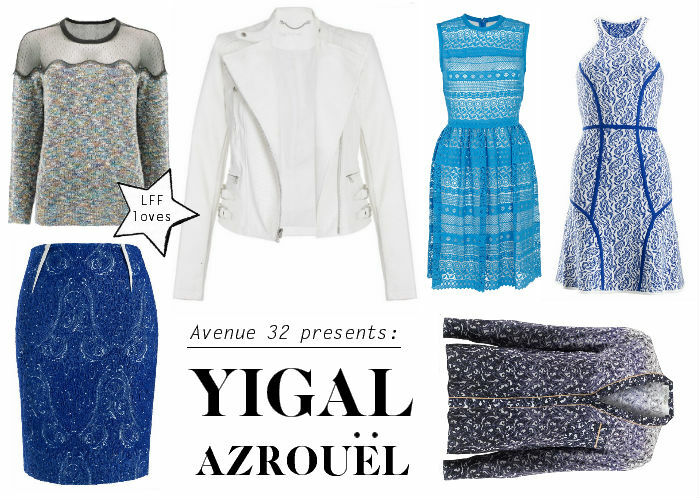 Shop my edit of Yigal Azrouel at Avenue 32. 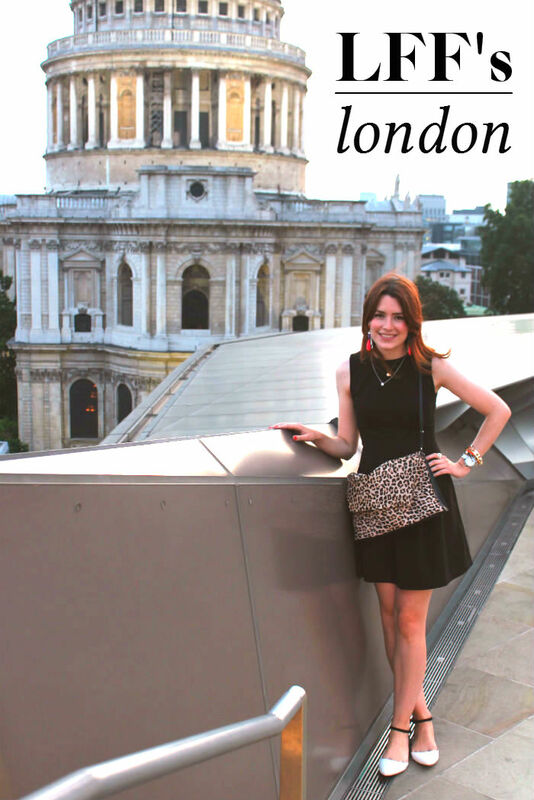 Welcome to a new feature that I am excited to introduce to the blog: LFF’s London. 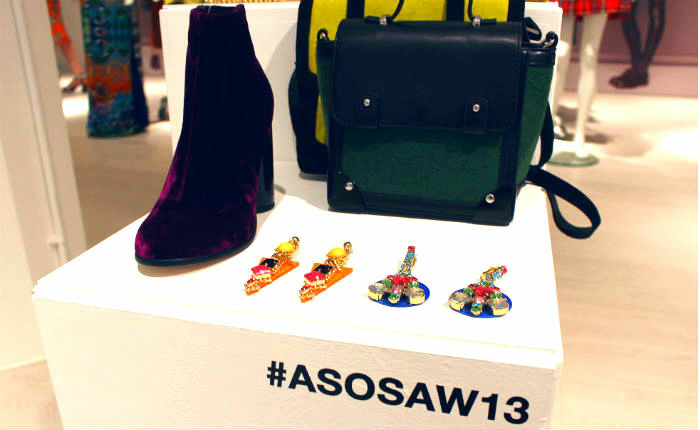 This regular addition to LFF will introduce some of the fashionable hotspots London has to offer; those super-stylish venues made for airing your new Choos and Mawi jewels. A brief background on me: I moved from the Midlands to the capital in 2010 and I have spent three years exploring this city I now call home (although in that time I have barely scratched the surface!). When it comes to dining/drinking out, I love an expertly-mixed cocktail and appreciate a stylish interior to offset a good menu. Location is also important; if a venue has a panoramic view of London then it will usually receive an LFF gold star. To open LFF’s London I was invited to an evening of champagne tasting at Searcys bar in St Paul’s. Searcys bars can be found in 5 locations across the city: St Pancras Grand, One New Change, Westfield London, Westfield Stratford City and Paddington. The St Paul’s bar is located inside shopping destination One New Change. Described as ‘a vibrant bar in the beating heart of the City, famed for its cuvée selection’, Made in Chelsea buffs (me!) might also remember Searcys as the venue Spencer Matthews chose for his first date with Lucy Watson.